Modular construction is gaining steam, but like any new technology there’s been a learning curve for contractors and developers. After analyzing surveys and case studies on modular construction, we’ve found a few recurring issues. Fortunately, you can avert these modular construction pitfalls with advanced planning and education. Introduction: What is modular construction and how is it different from traditional construction? Modular construction is the practice of building portions of a structure in an off-site facility, and then assembling them as modules in a larger structure. You can think of the modules as LegoTM bricks stacked into a larger structure by crane. Modular construction is ideal for buildings with repeating units. For example, Marriot uses modular construction to quickly assemble hotels with repeated rooms. As opposed to building on-site from the foundation up, modular construction keeps most of the building process in a controlled plant environment. When implemented correctly, a manufacturing approach to construction can improve quality control, create a precise construction schedule, and dramatically shorten time to completion. The market share of modular construction has been steadily growing over the past decade. According to an estimate from the Modular Building Institute, modular construction made up 4.9% of the construction industry in 2016. Pitfall 1: Change orders may be impossible after the design phase. It’s not uncommon in traditional construction to slightly pivot designs during the build-out or to plan on a rectification period to correct errors. However, with modular construction, there is much less room for improvisation. As soon as the modules go into production, changing the building’s final design may be very difficult or virtually impossible because changes may impact how the modules fit together. Solution: Plan for a longer, more collaborative design phase. Make sure your team understands the finality of the building’s design. You can prevent change orders by encouraging collaboration between the architect, the module manufacturer, and the local coding official before any modules go into production. The design phase in modular construction may last longer, but it also dramatically shortens the manufacturing and assembly phase. A thoroughly vetted design will also create a much more reliable project timeline and budget. Pitfall 2: Local building officials may be unfamiliar with modular construction. Usually local building officials send inspectors to construction sites multiple times to check each phase of the build-out. They may be uncertain of how to assess the safety of a building if a fully finished-out module arrives on the back of a truck. Solution: Communicate with the authority having jurisdiction before you build. The solution varies with the building site’s locality. Some states have created manufactured building programs and have taken steps to familiarize building officials with off-site construction. Other jurisdictions offer no guidance to building officials, pushing them to make one-off decisions about modular structures. Do research about any existing modular building programs and contact building officials during the design phase. Being prepared with engineer-approved designs can help your case. If the module manufacturer is relatively local, the building official may choose to inspect the factory’s process. In our experience, building officials just want to keep people safe. They will work with you if you loop them in early and act transparently! As modular construction grows in popularity, we anticipate the permitting process will get easier. 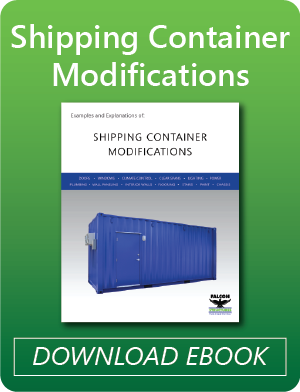 For example, popular demand has lead the International Code Council (ICC) to create AC462, an acceptance criterion for assessing the safety of shipping container-based modules. Coding officials can now trust that manufacturers with an ICC evaluation service report are producing container modules fit for use as building materials. Pitfall 3: Crossing multiple state boundaries with oversize loads means lots of permitting fees. In a case study from the report “Permanent Modular Construction,” a developer lamented that transporting their modules from the manufacturing facility to the job site was a major added cost in part because of permitting oversize loads. Their modules were wide enough to require oversize load permits from each of the six states they crossed. Hiring a lead driver and purchasing six permits for each of their modules drove up their budget. Solution: Consider hiring a local manufacturer or designing modules that fit within trucking limits. Factor the locality of the module manufacturer into your decision. Even if two manufacturers can create your modules at the same rate, choosing the closer candidate may save you a significant amount of money. You may also consider designing your modules to fit within typical trucking size limits. One advantage of choosing shipping container-based modules is that they fit snugly onto a truck bed. As long as modifications do not add to their width or height, container modules will not need oversize permits for transport. Pitfall 4: Storing the modules before assembly can be expensive. The non-profit Concern for Independent Living built a modular apartment in New York City with the aim of creating affordable housing. Unfortunately, they ran into unexpected costs when the modules arrived before they could get oversize load permits from the city. Because of the delay, the non-profit had the unenviable task of finding storage for an entire apartment building on short notice. Although they eventually assembled the structure in an amazing 12 days, storing the modules as they waited on permitting was a significant and unexpected expense. Solution: Determine how much space you will need for staging and coordinate the delivery schedule. The best solution is to avoid this scenario entirely. As discussed before, communicate with building officials before manufacturing. Determine what transportation permits you’ll need and find out how many modules you can store in your staging area. If you are limited on space, you may want the manufacturer to send out the modules in stages instead of all at once. Ideally a manageable number of modules would arrive each day, and a crane would stack them as they arrive. Pitfall 5: Liability can be unclear. With new building techniques will come new paper work. For instance, if a module is damaged during transportation, who is liable? The module manufacturer? The trucking service? The building owner? Solution: Draw up the terms and conditions before manufacturing. Spell out who is responsible for damage during transportation and other defects in an insurance-backed product guarantee. Just like everyone else on your building team, get your lawyers in early to go over terms and conditions. Pitfall 6: Unventilated spaces between joins may develop mold. Let’s say a modular hotel is being assembled in a warm humid place like Florida. If hot wet air gets caught between modules, mold can grow between unventilated joins and eat through the walls. Solution: Incorporate ventilation and vapor barriers into the design. This purported downside of modular construction actually isn’t specific to modular buildings. To achieve code compliance stick-built structures must also be designed to prevent trapping humid air. Adding vapor barriers to the sides of the modules or incorporating a ventilation system into gaps between joins are possible solutions. The steel walls of container modules conveniently act as vapor barriers as long as the seam between the joins is properly sealed. Like most buildings, laying a vapor barrier between the ground and the concrete foundation will also prevent moisture from seeping up into the building. The eventual location of the modular building should factor into the design. You will likely need to take different measures to prevent mold in a humid climate like Florida than the Arizona desert. You may have noticed a recurring theme in our solutions. Success with modular construction means putting a significant amount of thought and planning in the design phase. Regardless, evidence points to significant pay-offs in the overall project timeline if modular construction is properly implemented. In a survey from 2011, 66% of contractors that used off-site construction reported decreases in schedules. 35% managed to cut their schedules by four weeks or more. (Learn more in our infographic!) When carefully planned and executed modular construction can save even more time on a highly predictable timeline. In fact, the monetary value of modular construction mostly comes from the shortened timeline. Consider a scenario where a developer is creating modular apartments. If the modular apartment is completed nine months sooner, they can collect an additional nine months of rent. Like many new technologies, modular construction requires us to adjust our habits, but when we do the benefits are significant. 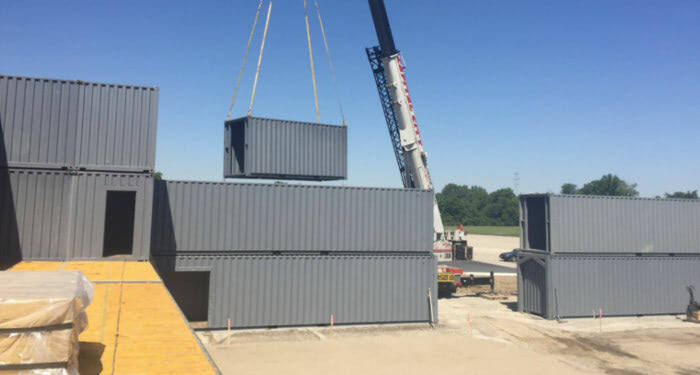 Have questions about container-based modular construction? Contact us at 877-704-0177 or sales@falconstructures.com.